"I like that Sheryl Crow, man. She can sing. Madonna though, she's a pig." I think the eyes are a little wonky and I realised too late that I secured the tail into place a bit crooked. Mistakes like this can be remedied by corrective positioning, but I'd prefer not to make the mistake in the first place. 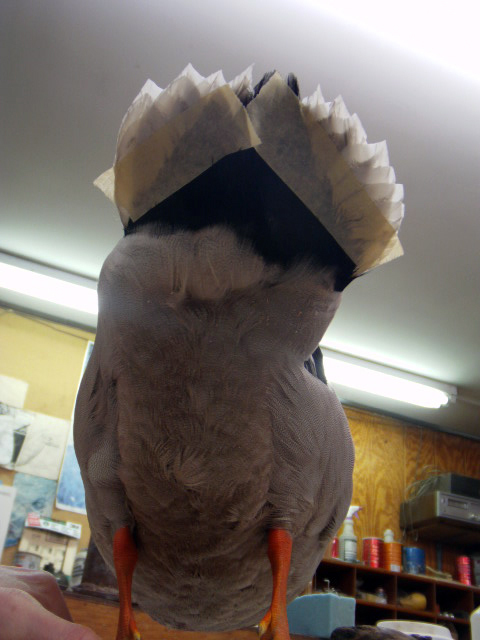 Here is the rear-view; tail feathers are taped in place for drying. 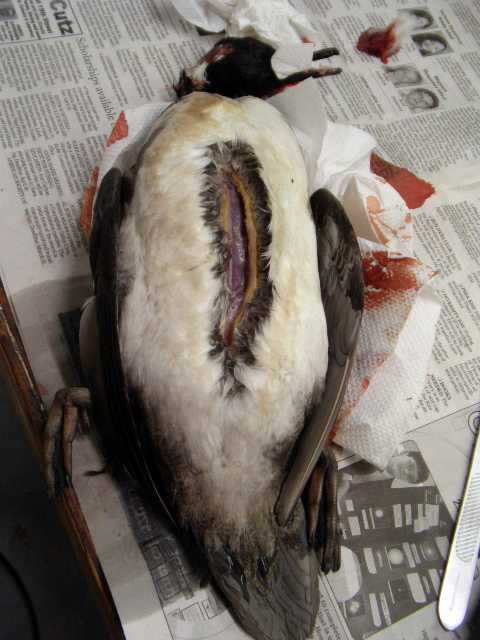 We then began skinning our hooded Mergansers, which I was very much looking forward to. My heart sunk just a tad though when I made my first cut and saw that this duck was even fattier than the last one! Speaking of grease, water fowl such as these two species have built-in glands from which they can extract oil with their beaks to distribute all over their feathers and aid in flotation. I cut them out of my Merganser and discreetly packed them away in my bag, hoping to discover a use for what surely must be nutrient-rich oil. It seems like such a waste to me to keep tossing body parts in a garbage can. Once home, I did a little research and found this product in which one of the main ingredients is duck preening oil. I've read mixed reviews of the cream online, but I figure using the oil straight from the source with no chemicals can't hurt. Besides, I've put stranger things on my face. I'll keep you posted. For these specimen, the original skull is used which means it remains attached to the head. 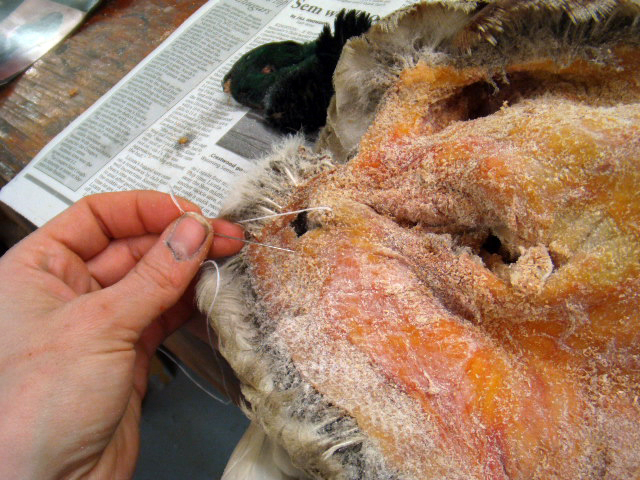 It can be tricky to invert without ripping the skin, especially when the head is on the larger side. 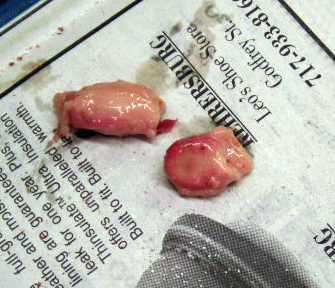 Also, it takes some finesse to cut away from the delicate ear/eye area. Here is mine, worked down to the beak. 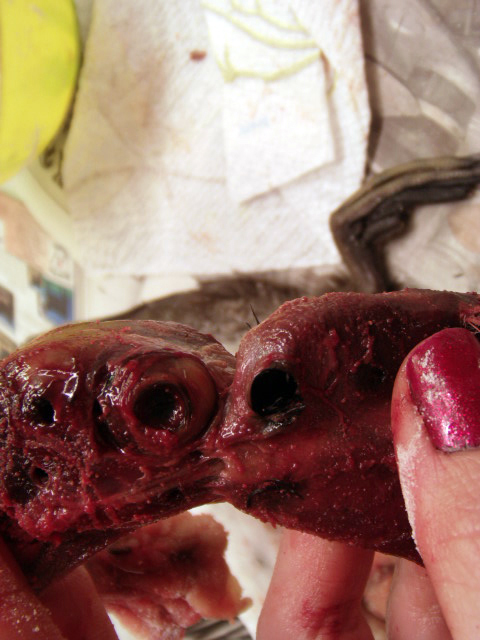 After this the skull gets cleaned, which just might be my least favorite part. Sorry, no pictures for that one. My fellow student gave me some Venison steaks from a deer her husband had bagged. She can't stand gamey-type meat so it was a relief to get it out of her fridge. I was quite thankful and promised to give her a full report on the resulting meal. When I got home I felt unusually tired so I skipped my hoop workout and drew a long hot bath instead while Sarah made dinner (leftover pork chops and salad). 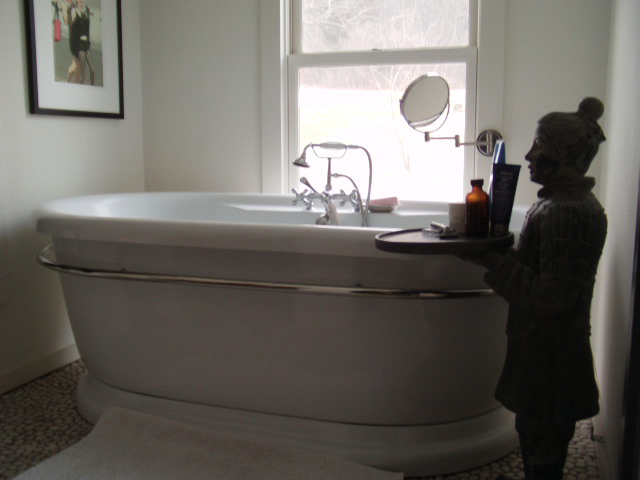 The tub is enormous and displayed exquisitely, as is everything else in the house. Just to be silly, I scattered some flower petals over the water before easing in with my People magazine. And yes, I was so blissed out that I took a moment to document it by taking a picture of my feet. The tub was almost too big; it was difficult for me to stay upright since I couldn't reach the end. I eventually just gave into it and sank down until just my nose poked out of the water. I think I must have zoned out because the next thing I knew if was completely dark. I got my cozy clothes on and went downstairs, built a fire and ate dinner with Sarah while we watched more "Flight of the Conchords". Afterward we enjoyed some White Russians while I painted my nails.